In spite of the old adage to "save the best for last" I would like to start this time with the highlight of my Spring 2005 Tour. None of us had the slightest idea of what to expect and apart from some faint hints we couldn't get more detailed information about this area. What we found there was much more then we ever dared to dream of. I can still hear Tony whispering "Oh my goodness" over and over again. Although this place isn't comparable to the Southern Coyote Buttes area, it has so much to offer, that it ranks among my favorite Big Five of the Southwest at the moment. The northern part of the Coyote Buttes can't compete with all those countless swirls and splendorous brainrocks you will find at the White Pocket. There is a gray rock layer, sometimes only a few centimeters thick, above the red sandstone that makes the whole landscape look like as if it was covered with icing sugar. 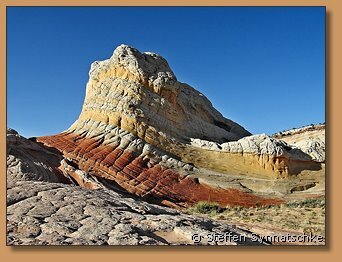 Some hills bear resemblance to the Checkerboard Mesa at Zion N.P., others shine in a golden glow, but it's the red and white colors that prevail at the White Pocket. In some spots the stone layers are completely twisted, just like an enormous marble cake. It's almost unbelievable, that these rocks were not artificially made and that they are just ancient petrified sand dunes. Everyone who wanders across the White Pocket will have to stop from time to time, take a deep breath and gaze with amazement. Especially during the evening hours this area reminded me of a giant Candy Store. Many of you are familiar with Laurent Martres and his excellent guidebooks Photographing the Southwest. As we were in contact for quite a while, I sent him my itinerary some weeks prior to my departure. To my surprise Laurent suggested to do the trip to the White Pocket together. A photographer and friend had already told him that this place was worth exploring. This friend also wanted to join us since his first visit was rather short. Unfortunately he had to cancel this trip, so that we were left with no one to guide us there. Since we had no longer a scout, it wasn't always easy to find the right way. At home I had printed all relevant topographic maps and marked the most important intersections. Without the help of these maps and my GPS receiver, it would have been quite difficult to reach our destination. Only once we missed the right turnoff, but we noticed it in time since the road led too far eastwards. Apart from that there were no further problems. Although the roads are generally in a good shape, they are quite sandy at some parts and a SUV is a must. According to the maps, the road should have ended at a fence, but to our surprise we suddenly arrived to our destination on the back of a sandy and steep hillside. We parked our cars at a giant slickrock field right in front of the brainrocks. I'll never forget that first sight, it was marvelous and stunning. Everyone of us were looking forward to exploring that mysterious place and, since it wasn't even midday yet, we had enough time to search for the best evening locations. 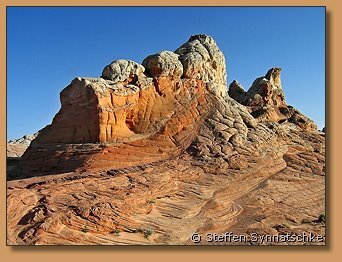 Just like the Cottonwood Teepees at the Coyote Buttes South, the most fascinating formations are located all on a plateau not larger than half a square mile. You won't need more than three hours to scout the whole area. But due to the countless photogenic features one could as well spend much more time here. Apart from the soft hills and the brainrocks there are also lots of interesting structures and colors. 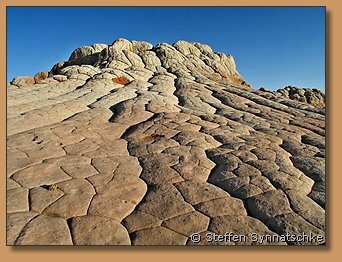 The sandstone offers the opportunity for some very promising "close ups". From the west edge of the plateau there is a splendorous view far across the Grand Staircase and on clear days with high visibility one can even figure out the pink cliffs of Bryce Canyon. If you are interested in rock art, there are some nice petroglyphs (bighorn sheeps) on the wall at the northern end of the White Pocket plateau - more or less 15 feet above ground. Right beside this alcove you might be able to figure out some Cowboyglyphs dated back to 1937. While walking across the plateau you'll discover some old reservoirs originally built by ranchers to provide their cattle with water during times of drought. There are still some visible cowtrails on the slickrock. These and the natural pools are filled with water during the winter months giving excellent opportunities to shoot some interesting reflections. As the afternoon progressed, the colors became better and better. During the daytime we didn't take many pictures but now in the evening light all of us were in a hurry and our shutters started to "glow". We could have gone on like that for hours but everything comes to an end. Since we slept on site in our cars, the thought of shooting some good pictures at sunrise was a consolation for us that night. Despite the gorgeous surroundings I've got some really bad memories of our night out there. My friends slept well but my sleeping bag was far too thin for the low temperatures. The thermometer showed 36°F, little above freezing point. Despite the two fleece sweaters I was wearing I shivered immensely and I was glad when the morning finally started to break. In my defense I have to mention that this was a debut for me, next time around everything will be alright. Since I already mentioned the Coyote Buttes I guess it's already quite obvious in which corner of the Southwest you'll find the White Pocket. 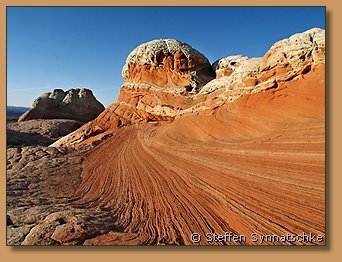 This lovely place is located on the Paria Plateau in northern Arizona and belongs to the Vermilion Cliffs National Monument. 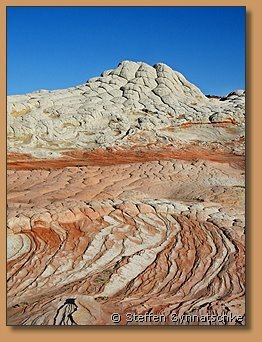 The White Pocket is a big rim and the nameless area we visited is located approximately 0.5 miles northeast of it. Since the white colors still prevail here, we decided to give this region just the same name. 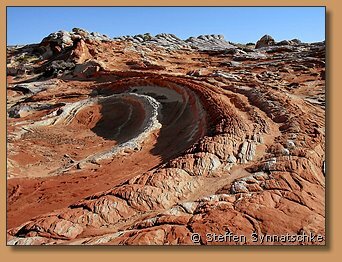 Although very near to the famous Coyote Buttes you don't need a permit to see the White Pocket (not yet? ), but a 4WD vehicle is a must. As far as I know there are three ways to get to White Pocket. Starting from the House Rock Valley Road they differ only in the last few miles. I took the dirt road heading through the Big Sink, while Isa describes the trip over Poverty Flat on her website. A topo map that contains both routes and the track to the South Coyote Buttes can be found at the end of this report (click on the topo icon). The track via Poverty Flat is marked in red, the route I describe is dashed. Since I am not familiar with the third alternate way I would rather prefer not to give any information about it. Everyone who wishes to pay a visit to the White Pocket just has to follow the House Rock Valley Road for more or less 20 miles starting from Highway 89. Then you move on to BLM Road 1017 heading eastwards to the Corral Valley. This gravel road leaves the main road 3.7 mi behind the side road to the Lone Tree Reservoir. After 3.1 miles you'll pass an old wooden fencing from which this valley got its name. There is a back road starting here that leads to the Poverty Flat and afterwards to the White Pocket as well. Although you won't be able to find the connection between Poverty Flat and White Pocket on a topographic map, this track definitely exists and we took that route on our way back. Especially for those who visit the Cottonwood Teepees it is a good option since you are spared the extremely difficult passage just behind Paw Hole. The road we followed appeared to be much easier and that's why I'm going to describe it. We left the BLM Road 1017 after 6.1 miles at the Pine Tree Pockets and turned northeast. You really have to pay attention at this intersection since there is another road on the left just a few hundred yards before. Both roads are well maintained and it seems that the locals use them on a regular basis to drive their cattle. Look out for the sign Big Sink at the right junction. After another 3.9 miles we followed a side road heading to the north (left). You can easily miss this turnout because the track is only faint and one can hardly see it. It's probably rather infrequently traveled. Those who don't want to rely on the tachometer of the car can use the following GPS coordinates: 36°53'03''N, 111°55'13''W (NAD83). The last part of our tour is for SUV only. You'll need to switch to 4WD while driving through deep sand during the next 6 miles. Since the area is quite flat it should be negotiable. Only the last hill could present a more serious problem. Before you reach the fence, only a couple hundred yards away from the White Pocket, a broad track branches off on the left side. This is the above-mentioned connecting road to the Poverty Flats. 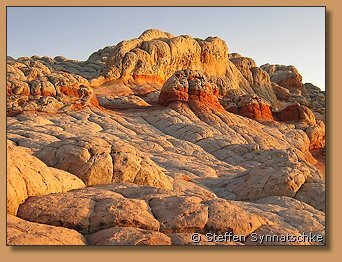 The distance from Highway 89 to the White Pocket is more or less 36 mi and the trip takes at least 1.5 hours. There is an alternate route to the White Pocket if you're coming from the South. The turnoff to the Corral Valley is only 9.5 mi north of the Hwy 89A (instead of 20 mi when coming from the North). The driving time from Page or Fredonia is considerably longer if you choose this way, but it is definitely the best choice if you spend the night in Marble Canyon or Jacobs Lake, since the House Rock Valley Road is in a much better condition near the Highway 89A and no wash has to be crossed along this route. 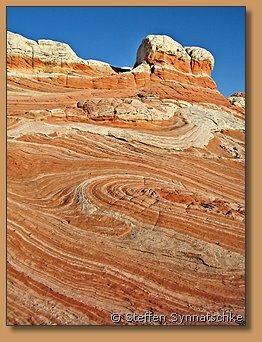 The part between Marble Canyon and the House Rock Valley Road is very scenic and you will be rewarded with nice views to the colorful Vermilion Cliffs. Warning: The dirt roads have deteriorated badly in the past few months. At the moment (October 05) only the Poverty Flat route (described on Isa's site) is more or less passable but not necessarily safe. The major problem you'll have to face is the Sand Hills, just 2 miles before you reach the White Pocket. You might want to park your SUV here and walk the rest of the distance. The best time to get through the deep sand is after a rainy day when traction is better and the sand is not that loose. Please drive carefully, because you get stuck very easily! A topo map with GPS waypoints can be found at the end of this report. Note: These are challenging 4WD roads with very deep sand. If you do not have the right vehicle or are afraid of driving here, especially if you are alone, check out the customized tours offered by Steve from Paria Outpost. 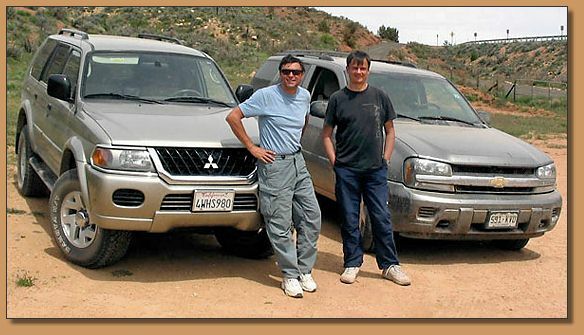 He is an excellent driver and specializes in off-road tours around Page. The price for a full day trip to White Pocket and Coyote Buttes South is $175 per person (group discounts may apply). 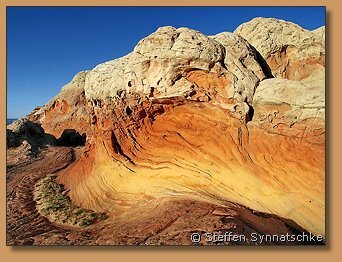 In my gallery you can find some of my favorite pictures of White Pocket.